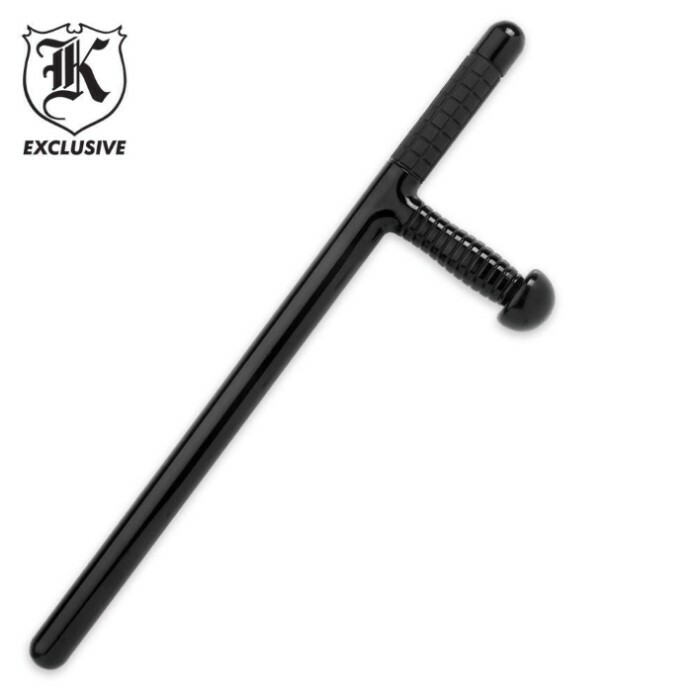 Night Stick | BUDK.com - Knives & Swords At The Lowest Prices! Strike with bone breaking force with this tactical baton. This 24" side-handle baton offers the rubberized grip, but also gives a side handle for versatile attacks. This was not what I expected. It broke after just a few swings at the top of the rubber handle. However you can drill a hole into the same handle, load it up with sand and seal it off to create a heavy weight tonfa. Just put enough in there to reach the handle and just top it off with liquid dryingrubber, glue etc. I am interested in weapons over all and Tonfa is a weapon I didn't have yet, so I ordered it, it looks beautiful especially the finish, it is heavier than i thought tonfa would be, but never had 1 so I wasn't aware of it's weight, I still have yet to learn how to use it, but it's great, you can get a nice grip on it and rubber handle feels nice. Good buy. Worth the money, thank you True Swords for quality of products, wide variety of products and great prices. I just opend my Tonfa from its packaging. I must say that it is very durable, and its a great purchase. The rubber grip is nice, and both the grips work great. Its a force to be reckoned with. I recommend this item to anyone intrested in a blunt weapon. PERFECT TRUE POLICE TONFA. Same size (it's very important for your training) and very pretty too. This Tonfa is awsome, the weight, the feel, it's great. I'm probably going to to buy a few more just to have. A great buy for anyone who wants a great product for self defense. 5 Stars. This was my second purchase from the site. And yet again, i'm impressed. This product's description really doesn't do it justice. As soon as i took it out of the packaging, i knew two things-- one, these tonfa are NOT to be taken lightly; and two, it will be worth the practice to be able to use them well. i would never pick a fight with someone who could use this properly-- one good swing would break something. Even a light one would make your opponent reconsider.